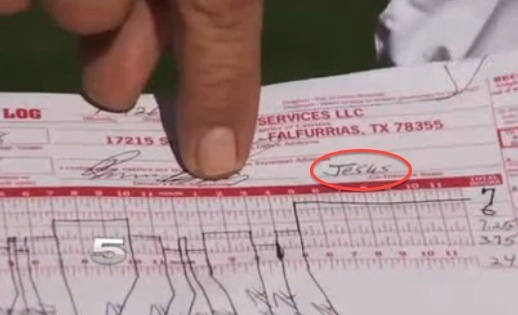 RIO GRANDE VALLEY, Texas — A truck driver in Texas says that he was fired for listing Jesus as his co-driver on log sheets that he is required to complete. According to reports, all truck drivers across the United States must keep a logbook, and one of the sections asks for the name of the co-driver. Ramiro Olivarez decided to write in Jesus in the section since he rides by himself, but believes that God is always with him. “The graph on there is strictly Ramiro Olivarez. And Jesus is my co-driver, and that’s my belief. That he’s with me,” he told KRGV-TV. But he said that he was fired from On Point Services, LLC. in Falfurrias for this practice. Olivarez was submitted with a letter of termination that accused him of “submitting incomplete documentation and falsifying legal documents.” It also stated that writing Jesus in as his co-driver was a violation of both federal and Texas law. But Olivarez says that he did not lie in the documents, and that he sees nothing wrong with writing Jesus’ name in the section. “Jesus is my co-driver, and I have no shame in that,” he stated. Olivarez said that he also received no warning that there was a problem with his practice, and that if he had been approached about the matter, he would have stopped. Reaction to the matter has been mixed.